Though released over thirty years ago, both The Evil Dead and Creepshow remain two of the most iconic and popular horror movies to ever grace the big screen to this day. So Fright-Rags is celebrating both legacy titles in a big way this week, with all new merch that is sure to send screaming spikes of joy up your spine and into your lungs. Just don't scream too loudly. We wouldn't want you to concern the neighbors. For many, the '80s were all about horror movies, VHS tapes, comic books, and trading cards. Fright-Rags manages to pay tribute to all of these nostalgic elements with its new releases for George A. Romero's Creepshow and Sam Raimi's The Evil Dead. The Creepshow collection from Fright-Rags kicks off with a Creepshow Video Series box set. 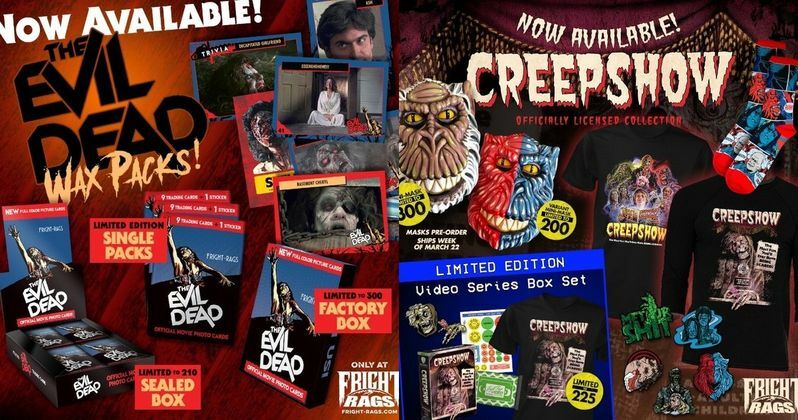 Limited to 225, the package includes an exclusive shirt featuring the film's original poster art by Joann Daley, The Creep two-piece enamel pin set, VHS sticker sheet, and Fright-Rags microwave popcorn, all packaged in a collector's box that looks like an oversized Creepshow VHS. Fright-Rags has also created Fluffy mini-masks. Based on Tom Savini's creature from Creepshow's "The Crate" segment, each 6" retro-style mask is packaged in a cardboard crate box. It's available in two colorways: standard (limited to 300) and red/blue (limited to 200), which emulates the film's comic book-inspired lighting. The massive Creepshow collection also offers an enamel pin from each of the anthology's five segments, custom-knit comic panel-style socks, Daley's artwork on baseball tees, and a reprint of Justin Osbourn's bestselling Creepshow shirt. There is currently no movement on Evil Dead 2, a sequel to the reboot, but we've heard it's still in the works. Bruce Campbell recently retired the character of Ash Williams after appearing on three seasons of Starz' Ash Vs Evil Dead, which finished its run last year. As for Creepshow, Shudder is currently shooting a new anthology series based on the classic collaboration between Stephen King and George Romero. We've already gotten a peek at the Creep's return, and King will be contributing at lease one episode to the new series. You can check out the spooky new VHS-inspired merch from Creepshow below, and any card trader will surely want to get their hands on these new Evil Dead trading cars, that let you revisit the Sam Raimi classic in a new and frightening way. Just don't hide them under your pillow. That may give you unintentional nightmares you won't be able to contend with.